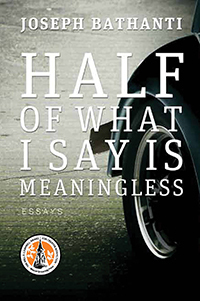 HALF OF WHAT I SAY IS MEANINGLESS is a series of memoirs, set by turns in Joseph Bathanti’s hometown of Pittsburgh as well as in his ultimate home in North Carolina where he landed in 1976 as a VISTA Volunteer assigned to the North Carolina Department of Correction. Though these essays are not queued chronologically, they form a seamless chronicle of contemplation on the indelible stamp of home, family, ancestry, and spirituality, regardless of locale. The book opens with its longest essay, “The Turf of Hankering,” which tells the tale of Bathanti’s leaving Pittsburgh for his VISTA training in Atlanta, meeting a Southern woman, and fellow VISTA he is destined to marry, his lurch into the American South where he would eventually make his beloved home, and his first attempts at becoming a writer. Written in a voice that is always elevated, though conversational, wry, funny, quintessentially human, and laced with poetry, the other thirteen essays of the book explore his early conflicted obsessions with Catholicism; Bill Mazeroski’s famous 1960 World Series home run; a life-changing visit to writer Thomas Wolfe’s boyhood home in Asheville; the Vietnam War; his mother and father and his Italian-American identity; the concept of work and what it really means; the netherworld of prison; marriage and fatherhood; his day as an extra in the cult-classic horror film Evil Dead II; and the unlikely path, ever unwinding, that led him ultimately to achieving his dream of becoming a writer.